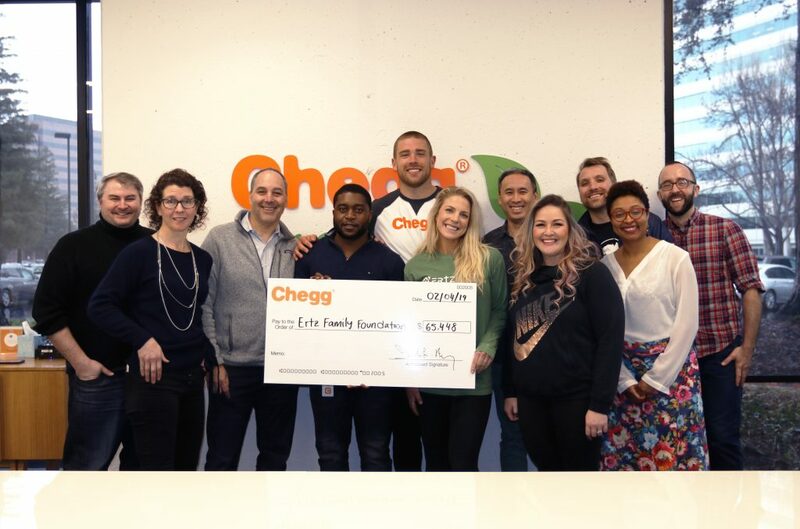 During the regular NFL season, Chegg Inc. (NYSE: CHGG), the Smarter Way to Student™, partnered with Philadelphia Eagles Tight End, Zach Ertz, for the ‘Catches for the Community’ campaign, a performance-based charitable initiative benefiting the Ertz Family Foundation’s education focus. The ‘Catches for the Community’ campaign was based on Ertz’s 2018 – ‘19 season for breaking the record for the most receptions by a tight end in a single season. To support the Ertz Family Foundation, a public benefit organization founded by Zach and his wife Julie, Chegg pledged $860.00 dollars for every first down Zach earned (66) and $1,086.00 dollars for every touchdown (8) totaling $65,448 in funds raised for education. Chegg honored Ertz’s jersey number (86) by tying campaign dollar goals to it. Ertz, a twice nominated Pro Bowl tight end, scored the winning touchdown in the 2017-18 world championship for the NFL’s Philadelphia Eagles. In the 2018-19 season, Ertz played a career-high 91.6 percent of snaps and set a single-season record for tight ends with 116 catches. He has been named NFL Players Association Community MVP for Week 5 as a result of his work to change the lives of children in Haiti through the Foundation’s scholarship program. In 2018, Ertz and his wife Julie Johnston Ertz, a World Champion and starter for the U.S. Women’s National Soccer Team, established the Ertz Family Foundation. Initially, the Foundation’s work will focus on Philadelphia, the San Francisco Bay Area and Haiti.